With its exclusive and unmistakably Italian design, the 850 Mana is unique among motorcycles. Its revolutionary Sportgear transmission is electronically controlled to deliver unrivalled riding pleasure. No ordinary motorcycle, the 850 Mana is destined to change the riding habits of bikers all over the world. The Mana takes all the stress from motorcycling while injecting more satisfaction and more fun into riding under all conditions, from commuting to sports touring on the open road. All you need to do to enter a whole new world is press the button on the handlebars. Everything is managed by an electronic control system that leaves you free to relax and enjoy the ride. The transmission management system offers a choice of three “Autodrive” mappings plus a manual, seven speed, sequential gearshift. The clutch lever has gone: the extraordinary sportgear transmission gives the pleasure of a very quick gearshifting with brilliant performance, especially in acceleration. On the Mana you can be absolutely certain to find the perfect ratio for any traffic condition and riding preference. Whether you are just nipping across town or blowing away the cobwebs on a winding country road, the 850 Mana always delivers the ideal response and the same unique riding satisfaction. Whatever the conditions, and whoever the rider (even the most demanding), the Mana guarantees a perfect, peak-efficiency ride that lets you discover hitherto unknown potential. Sequential mode: The rider decides for himself when to change gear, either using the conventional pedal or a switch on the handlebars. A servo mechanism shifts the main pulley to change between the seven gear ratios amazingly quickly. Semi-Autodrive mode: it allows the rider only to change down independently. This is particularly useful for overtaking at maximum torque revs or for boosting engine braking when riding down a hill. Aprilia has always believed in utility design, but has developed the concept to its maximum expression on the 850 Mana, creating a naked that is more versatile than any other. The saddle height is only 800 mm. Loading capacity has no comparison in the motorcycle world. The 16 litre tank is located under the seat, lower than normal, to distribute weight more evenly and lower the bike’s centre of gravity. The “traditional” tank location is occupied instead by an illuminated storage compartment that is lined with non-slip, non-scratch material and big enough to house a full face helmet. The compartment also incorporates mobile phone storage and a 12V power socket. The vehicle documents and toolkit are also located inside the same compartment. The 90° V engine configuration, chosen for torque and power delivery, is the perfect match for this type of transmission. The engine delivers 76 horsepower at the crank and well in excess of 7 kgm of torque (at 5,000 rpm). As is traditional for Aprilia’s big bike engines, lubrication is provided by a dry sump system, with a separate oil reservoir integrated inside the engine to minimise overall weight. Efficient engine breathing is ensured by a generous size filter box and exhaust system. The electronic engine management system incorporates a sophisticated Weber Marelli electronic fuel injection unit with a single 38 mm throttle body and twin spark ignition. The Mana’s high performance engine respects the environment keeping emissions well within the limits established by Euro 3. The robust steel tube trellis frame sets new standards for this class of machine and ensures top level handling in line with the characteristics of the innovative engine. The single piece aluminium swingarm is damped by a monoshock that is laterally offset to free up space for the exhaust pipe behind the engine and make the motorcycle more compact. The 850 Mana has a wheelbase of only 1,463 mm, extremely short for a naked. The 43 mm upside down fork slides easily and features an optimised setup for excellent performance even under sport riding conditions. At the rear, the monoshock is operated directly by the swingarm and offers adjustments for spring preload and hydraulic rebound damping. Impressive stopping power is delivered by the very best braking technology currently available, developed in-house by Aprilia. Radial calipers with 4 pistons are the state of the art for motorcycle brakes and ensure maximum active safety under all braking conditions. The generous front discs are 320 mm in diameter, the standard size for Aprilia’s big bikes, and are complemented by a single 260 mm rear disc. The Mana is a mid-displacement sports motorcycle with engine mapping modes and a unique Gear System that allows automatic or semi-automatic control of the drive system for sports performance. To some motorcycle purists, scooters either large or small, and by extension two-wheelers that utilize similar technology will never be acceptable. For two-wheel enthusiasts however, including myself, this is the start of something evolutionary and exciting. The Aprilia Mana provides options that are familiar to most scooter riders, but not to most mid- or large-displacement motorcycle riders. These options do not detract, but rather enhance the rider experience. IUPDATE: Aprilia Mana to get ABS option in 2009! Part of the massive Piaggio Group, the origins of Aprilia date back to just after the Second World War, when its founder, Alberto Beggio, established a factory in Noale, province of Venice, to manufacture bicycles. The products of this small workshop laid the foundation for innovation, quality and technological capabilities that have become Aprilia trademarks. 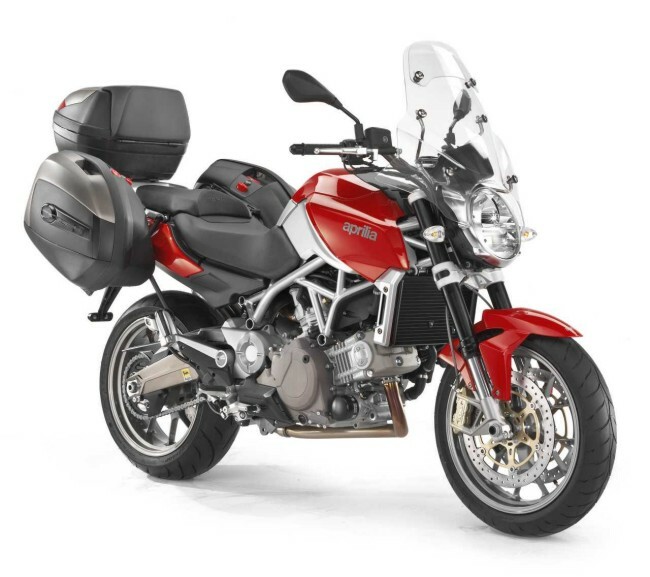 Initially shown at the 2006 EICMA Milan Bike Show, the Aprilia Mana 850 was released as a 2007 model in Europe and has now made its way across the pond as the 2009 Aprilia 850 Mana. 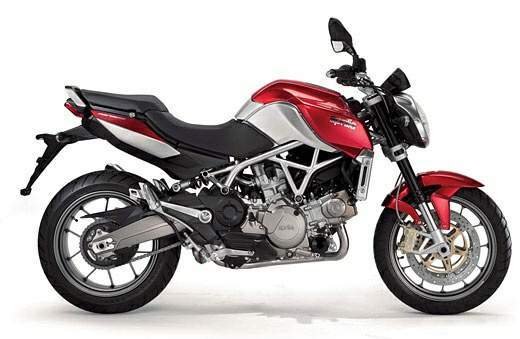 Giving Aprilia its due, this is not a concept machine like those currently being shown by many other manufacturers, but a well-designed and finely executed two-wheeler that looks, feels and handles like an extremely competent mid-displacement sports motorcycle. Although admittedly less hard-edged than its smaller sibling the 750 Shiver, the Mana has all the performance and handling goodies found on other sports-oriented Aprilia models. Aprilia is renowned for its sports machines and the Mana does nothing to change detract from that reputation. Like most modern two wheelers, manual transmission or otherwise, the Mana has a number of features and controls that are both extremely logical, and at the same time, unique – all contributing to the pure functionality of this motorcycle. The Mana utilizes an immobilizer system, which has more or less become a standard feature on two-wheeled conveyances, with the keys coded for the motorcycle. If none of the keys put in the ignition are verified by the on-board system, the immobilizer prevents the motorcycle from being started. Two coded keys are provided with the motorcycle, and up to four coded keys can be supported by the system. A major clue as to how the Mana 850 is driven is most often missed. But to the discerning eye, the parking brake level, located on the left side, just behind the large round Sports Gear System cover, is quickly seen for what it is. When stopped, the rider simply pulls up the lever to activate the brake and releases it before moving off or starting the motorcycle. Aprilia handlebar controls are typically innovative, and for the Mana 850, even more changes have been made. On the right control, the rocker-style switch serves a dual purpose - it functions as the engine-shut-off switch for emergency use and when the right side is depressed (along with one of the brakes), it functions as the starter. Just above the red rocker switch is another important input - the Gear Mode control. When the motorcycle is turned on and idling, this button is toggled to select one of three primary engine mapping modes (more on that later). The left control is a little busier. The centred mode switch provides three-way mode control for using and programming the on-board display computer. A standard turn signal switch performs the standard left, right and push to cancel functions. There are two electronic shift buttons, located within easy reach of the left thumb – the inside button is for Gear UP (+) and the outside button is for Gear DOWN (–). The front of the left side control also houses the Passing Button/High Beam Switch and below it, the helmet compartment opening control - this electronic release only works when the motorcycle is running. A manual release mechanism is also provided under the passenger seat. There are a lot of lights on the display panel, many functioning as status indicators for the Gear Drive system. All the lights are logically grouped and clearly seen, day or night. The left turn signal light and the high beam indicator lights reside on the left side of the display. There are six lights on the right hand side. The first four are used to indicate the RPM range when the drive system is in the Sport Gear Mode. The next light is Green – for the right hand signal, while the bottom indicator, shaped as a warning triangle is the general warning light. Finally, an Amber fuel reserve indicator light sits just above the large square LCD display. The large LCD Display, along with the speedometer is used to display the primary information to the rider. Most of the now-standard status and monitoring functions are available while a secondary menu allows some very specific information to be monitored or parameters to be adjusted. All in all, the display and input system is extremely sophisticated and easy to use. A parking brake reminder and a side-stand indicator on the main display are nice safety touches. Location, location, location – a theme for real estate, this also applies to the helmet/tool kit compartment strategically located in front of the rider in the space sometimes reserved for a fuel tank. With the motorcycle running, the trunk can be opened electronically via the left handlebar switch. The trunk can also be opened manually by inserting the key in the rear seat lock just below the taillight, flipping up the rear seat panel and accessing the recessed latch that opens the compartment. The compartment has a courtesy light on the left side wall, and a DIN power socket on the left rear wall of the compartment, rated for 180W – perfect for the portable cappuccino machine! Be warned however that leaving the trunk open for extended periods of time will keep the courtesy light burning, putting a drain on the battery. The compartment is quite large – designed to hold a standard helmet, a small Nolan N102 helmet is a very tight fit, although a smaller ¾ or jet style helmet fits just fine. If not stuffed with a helmet, the compartment serves as secure luggage storage. On day trips it held everything needed, including the camera kit. So, where is the fuel tank? Well, the plastic tank resides discretely under the rider and passenger seats. Overall capacity is 15.5 liters (4.10 US gallons or 3.41 Imp gallons), including a 3.3l reserve. Over three days of riding, the average consumption was 55.6 miles per Imperial gallon, using 91 and 94 octane fossil fuel (46.3 U.S. MPG or 19.67 km/l). The plastic tank, accessed via the flip-up passenger seat, has a non-vented screw-on gas cap and to meet emission standards the tank is treated as a sealed unit, with all gaseous emissions routed to the Evaporative Emission System canister, mounted in a highly visible spot on the right front of the engine. 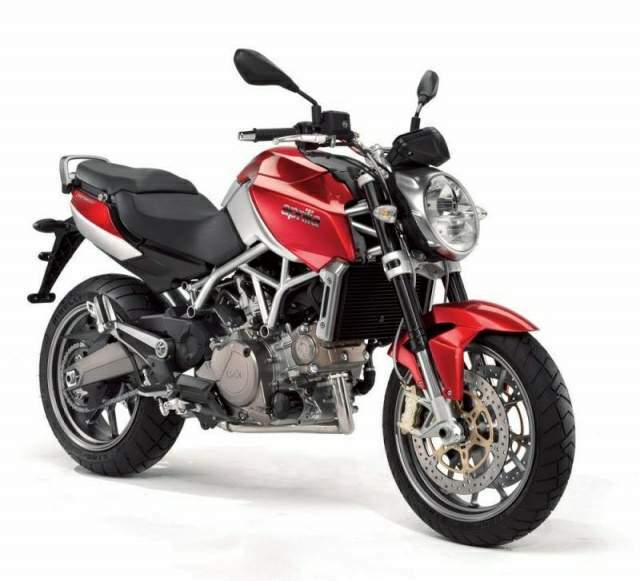 Although somewhat obtrusive and not keeping with the overall style and form of the Aprilia Mana 850, the system is there for many reasons and should not be tampered with. Aprilia suspension systems are typically very good and the Mana’s is no exception. The rear shock, mounted on the left side, is mounted in line with the large diameter tubular trellis frame tubes. This shock layout helps keep the overall wheelbase short. 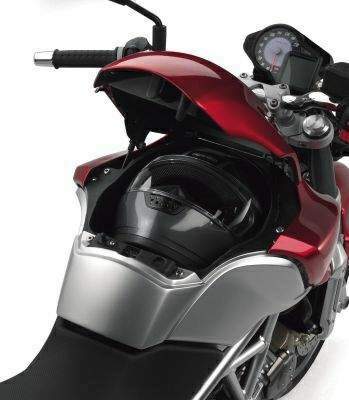 The placement of the shock means that both spring and dampening adjustments can be made quickly: a small sticker on the shock body identifies recommended settings based on rider, passenger and luggage combinations – a small thing overall, but indicative of the attention to detail evident on the motorcycle. 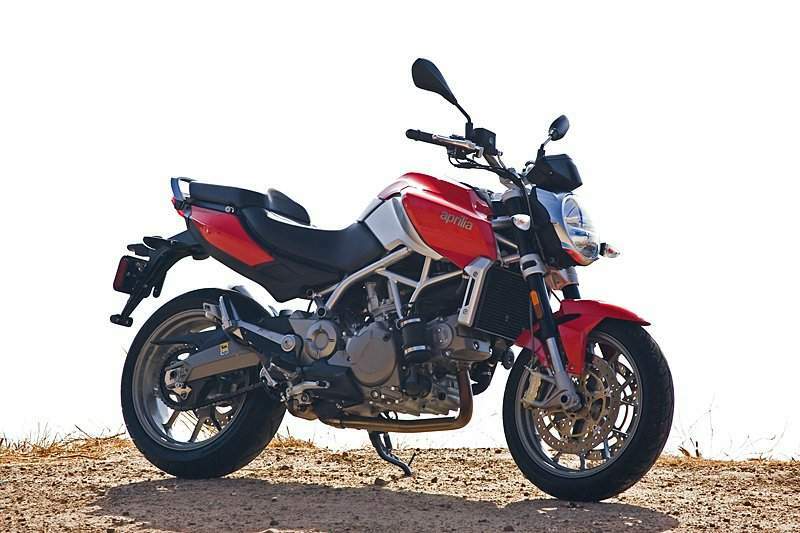 The front fork feels soft compared to the Aprilia Shiver, but it still works (very) well – the front end remains stable over some very rough surfaces and feedback to the rider is consistent. Lacking any adjustments, the front end is obviously well set-up for a wide-range of riding conditions. Some rider ergonomic adjustments are available - the shift lever (as used) and the rear brake pedal can be repositioned somewhat via individual eccentric adjusters. The handlebars could be rotated slightly if desired, but the stock handlebar position was just about perfect for my 6ft 3in frame and 34 inch reach. Seat height is 810mm (31.89 in.). The rider portion of the saddle is comfortable for most of a day, with the odd break for fuel and food thrown in, but another inch of height would have been nice to fit my 33.5 in inseam. Having lower and higher seat options would make the Mana 850 that much more inviting for virtually all riders. The Primary and final drive mechanisms are extremely smooth and quiet. Engine power output and transmission settings are controlled by the Sport Gear System, based on a high-tech Constant Variable Transmission (CVT) unit with a long-life drive belt (20K Service Intervals) and final drive via chain. The drill to getting underway is to sit on the motorcycle, release the parking brake, retract the side stand, turn on the ignition, wait for the panel to go through its initialization process (about six seconds), make sure one brake is on and, push the starter button. This brings the extremely quiet V-twin to life. After a bit of low idle – good for warm-up and for selecting the desired driving mode, a gentle turn of the throttle brings about forward motion and brisk acceleration. A little harder turn of the throttle really increases the acceleration factor, especially in Sport Drive mode. The Mana is no slouch -- the 839cc V-twin SOHC 4V per cylinder motor provides lots of punch, no matter the mapping mode and the CVT transmission optimizes engine output at all times. Its ability to gather speed, quickly and quietly, is deceptive, due in large part to the CVT transmission. This drive system and its related housings make the Mana one quiet machine, a fact that only adds to the deception as the landscape begins to blur and the rider is forced to take a hard look at the speedometer. This feeling occurs regularly, no matter which of the two main modes, Sequential or Auto-Drive, is used. In Sequential Mode, the transmission is controlled by the rider. Shifts can be made by either shifting up and down through seven gear ratios by using the standard foot lever, or even faster by using the Up and Down buttons on the left handlebar control. When Sequential operations are used by the rider, the default is the Sport Gear mode, which does not place any limits on power and is the best option for sports riding – a fact readily validated on every hilly and winding road covered during this evaluation. In Auto-Drive, all the rider has to do is use the throttle and brakes - the system automatically handles the rest. During braking and deceleration, an additional mode ‘SemiAutomatic’ can be brought into play, allowing quicker downshifting and more engine braking, etc. This additional mode is automatically engaged if the Gear Down (–) is activated, in which case the LCD display will display the Gear in use beside the DRIVE identifier. If the Gear Up (+) is activated, Semi Automatic mode will be disabled and Auto-Drive will resume. As with the Shiver, three engine mapping modes are available: Sport, Touring and Rain. Although rider-selectable, the feature is controlled by the Mana’s Auto-Drive system. Sport Mode offers the most power - the engine runs at a higher RPM, gear changes are rapid and more engine braking is evident. For constant or sustained high speed runs, the Touring mode is optimal as the engine runs at a lower RPM and fuel consumption is increased (verified). Rain Mode is the ‘softest’ mode and during the evaluation it was used quite a bit – our summer has been pretty wet to say the least. This mode is perfect for urban use and when traction might be an issue (see wet above), as CVT response is near seamless with this setting. For those familiar with the 508 and 511 routes in the Highlands regions of eastern Ontario, it is sufficient to say that the Mana, like the 750 Shiver, is an absolute blast on this type of road. Accessing the twisties via local streets and then the 416 and 417 multi-lane slabs also serves to demonstrate how adept the Mana really is. Whether leaned way (way) over, cruising at highway speeds or running traffic light to traffic light, the Mana’s discrete engine mapping modes and transmission/gear options, all available at the push of a finger, are attributes that cannot be ignored. With a 21 litre Marsee teardrop bag strapped on for a perfect fit and an optional set of soft luggage, the Mana is a good option for weekend trips or extended sports-touring. I would not hesitate to take the Mana on a longer trip, such as was just completed during July. It is apparent that Aprilia intends to provide some enhancements for the Mana; browsing through the very well laid out and complete Use and Maintenance Book identifies side bags, glove compartment items, windscreen and mud-flaps as accessories. Although Euro 3 compliant, some additions have been necessitated for the North American market. The black canister and tubing, all mounted on the front right side of the engine, is the California Evaporative Emission System. This is required by the US Environmental Protection Agency (EPA) and California Air Resources Board (CARB). The system has a five year or 30,000km warranty (whichever occurs first). From a North American market perspective, the 2009 NA Mana is one of the first but surely not the last of its kind. With a high-output V-twin motor and a well-mapped engine and transmission management system, the Mana is a high-performance mid-displacement motorcycle – that much can be felt immediately. Although the price differential in the Canadian market is about $2,000.00 CAD more than for its smaller sibling the 750 Shiver, the higher cost is largely mitigated by the Mana’s design features, the application of technology and convenience of use for a wide range of riders -- current and future -- far more than any other comparable motorcycle. Aprilia states that, ‘the Mana is really a number of motorcycles rolled into one, a bike for all seasons, designed to put safety, versatility and easy riding first.”. I couldn’t agree more regarding that statement. Is the Mana magic? Perhaps not, but technically and functionally, its whisper-quiet drive system, seamless power output and sport-level handling make the connotation relevant. Its styling turns heads, and its features are topics of endless conversations at every stop. The Mana just feels right. After three days of constant use it was reluctantly returned to the dealer.